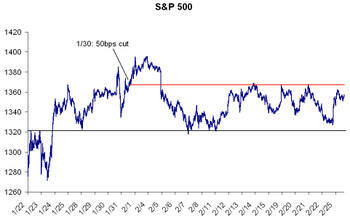 Since a disappointing ISM number caused a 3% sell-off on February 5th, the S&P 500 has not rallied above its level at 2pm on January 30th (coincidentally that is the date and time of the most recent rate cut). The market lacks direction and thus has most players feeling pain. The best advice to offer in this kind of a situation is to make up your own mind about the LONG TERM direction of the market, allocate assets and not become overly concerned with day-to-day moves. 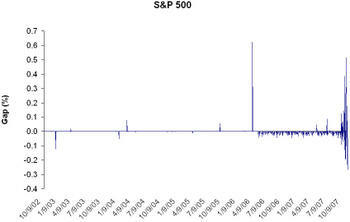 As painful as this month may seem, the S&P 500 has been mostly flat since the third week in January. 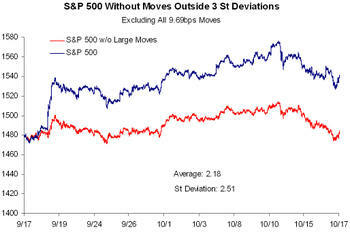 The range shown below represents a 3.5% move for the S&P, which is also indicative of the sometimes disturbing ups and downs. The point to take away is this: in these conditions individual investors and even small institutions can get lost in the storm. When 1% rallies are sparked by a headline or a rumor there are certainly opportunities but carry with them a great deal of risk. 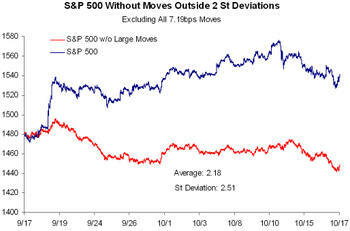 The current market (by that we mean from 7/6/07 to present) has been characterized by volatility, erratic trading, and a tendency to pounce on the news of the day. Birinyi Associates published a research report last fall, as advertised several times, entitled the next CRASH, which examined the impact of new investment vehicles and fewer regulations. Today's market requires nearly undivided attention, and long term investing is all but useless. 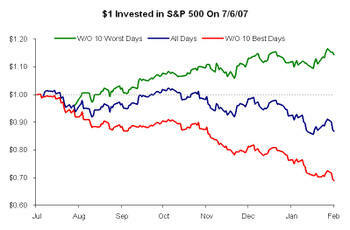 The first chart below shows the performance of a $1 investment in the S&P 500 on the close of 7/6/07. 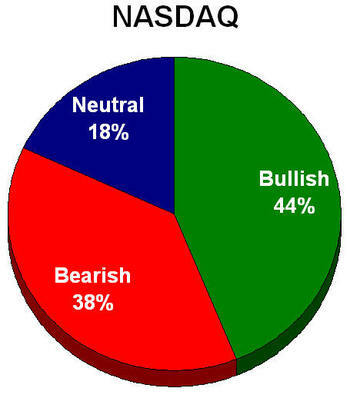 Assuming you are the most intelligent trader in the world and you sold the open and bought the close of the 10 worst days since then you would be up 14%. If you had bought and held you perform inline with the market, down 13%; if you had sold the open and bought the close of the 10 best days you would be down 31%. So what's the point? 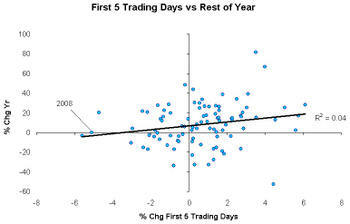 Between 7/6/07 and 2/6/08 there were 149 trading days, if you remove ten of those days from the picture the market is up! Point being: in this market, when you have a profit take it. 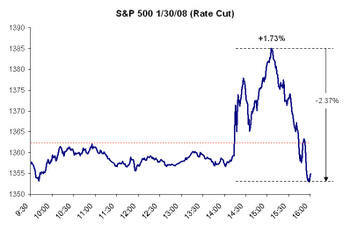 Example number two of the benefit of short term trading was seen on 1/30/08 when the FOMC cut interest rates by 50bps. Good news turned bad in the blink of an eye when Fitch cut their rating on FGIC. Recently Ticker Sense submitted a poll to anyone interested in participating; thank you to all who did. After the institutional outlooks, and the first few trading days of the year we asked our readers how they feel about 2008. 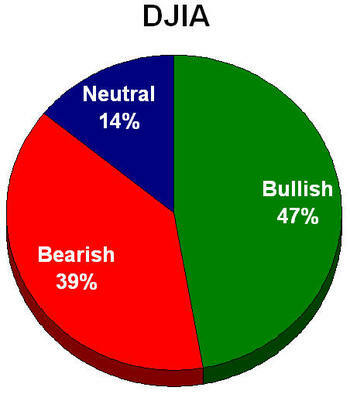 Readers were most bullish on the Dow 30, and most bearish on the S&P 500 Consumer Discretionary sector, although results for the indices as a whole were split. The indecision reflects the current state of financial markets. We think it explains the volatility and most likely the reason why we will remain trendless until an extreme is reached. 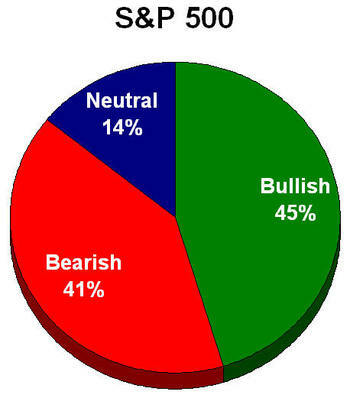 Some analysts at the onset of 2008 have noted that a bad first day leads to a bullish year, others have said that the first five days of trading are an indication of the year ahead. 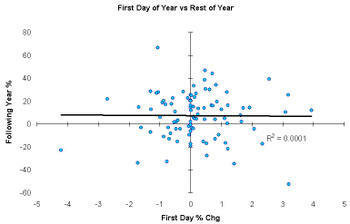 The scatter plot below shows the percent change in the Dow Jones Industrial Average over the first five days of trading versus one year performance dating back to 1915. As shown, the trend line is sloping up indicating some correlation, but the R squared value of that trend line is 0.04 and can hardly be deemed significant. 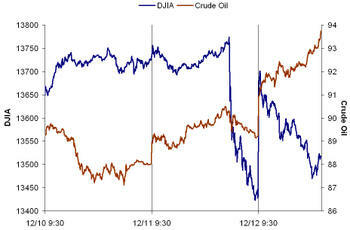 If not the equity markets, the Fed certainly gave crude oil prices a direction. Crude is currently up 4% on "Signs of a stronger economy." Both the Dow and the S&P 500 have been led down today by financial stocks, because illiquid markets will result in recession. So far the only sector expected to post a year-over-year decline in any of the next four quarters is financials. 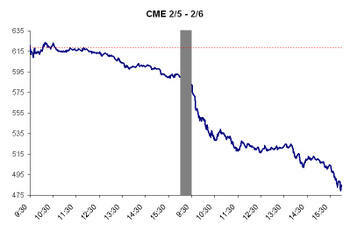 Bottom line: either the estimates will be revised or the oil traders are wrong. Until recently it had been the mission of the S&P 500 index to eliminate gaps in the calculation of their index. After hours changes in stock prices were assessed as those stocks opened, but the opening price of the index was usually equal to the closing price the day before. In other words, an multi-day intra-day price graph would be continuous and any gaps in the components would be reflected as a sharp decline during trading hours. 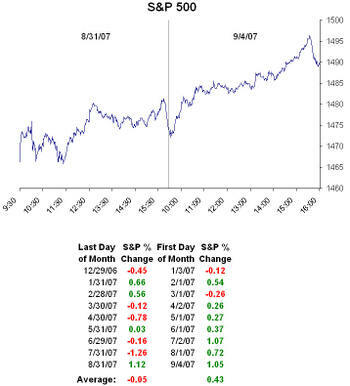 Below we highlight the S&P 500, DJIA, and Nasdaq indices, and their day-by-day gaps since the start of the 2002 bull market. 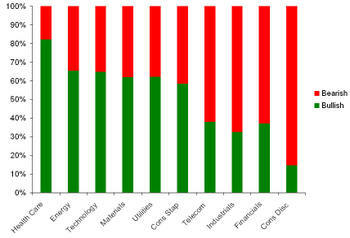 There has been much chatter recently about the market capitalization of Chinese stocks. 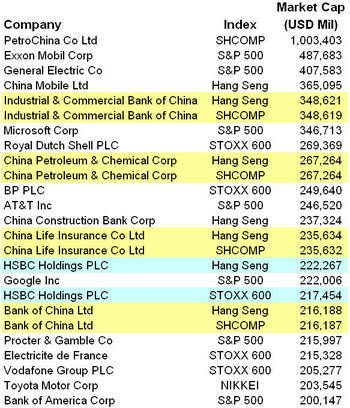 It is true that PetroChina (PTR) is the first trillion dollar company; however, four of the five Shanghai Composite stocks appearing in our Top 20 list are also listed on Hong Kong's Hang Seng index. Maybe not a hugely significant fact, but while the Shanghai Composite is considered "emerging," the Hang Seng is considered "developed." 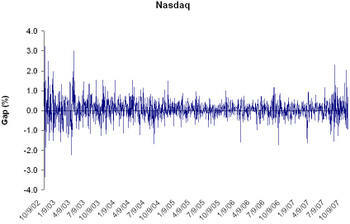 Volatility is Good: "Gotta be in it to win it!" Several of us have wondered, perhaps you already know, where the shares are trading these days. 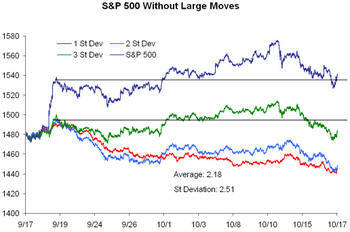 It was curious that during the recent recovery from the July correction, volume seemed unusually low. 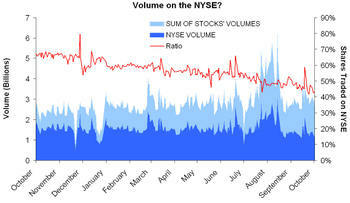 We looked back over the past year at the shares traded for each stock listed on the New York Stock Exchange versus the volume actually traded on the exchange. The analysis, shown below, yielded an interesting conclusion. While most analysts and investors agree that trading on the floor of the exchange is obsolete, and the building will become a museum in the next year, it seems that trades executed through the NYSE are also dwindling. A year ago 68% of all of the shares for NYSE listed stocks were traded through the exchange, now that number is 43%. To further illustrate: on 8/16, when the record 2.9 billion shares were traded on the New York Stock Exchange, that number was actually more like 6.2 billion for the stocks. Over the course of this year, we have noticed an anomaly. 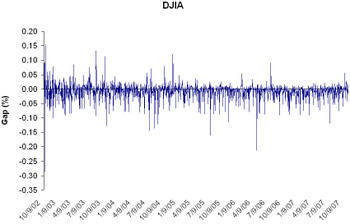 The last day of the month seems to be a buying opportunity in order to be a seller on the first day of the month. We imagine that with the many funds in play these days, their re-balancing explains the market's moves. As with any seasonal changes ("Santa Clause Rally," "Summer Rally"), if this monthly gain/loss in the market continues we may see hedge funds begin reporting to their investors as of the second to last day of the month.